10x28 RV with deck, picnic table, gas grill with gas burner for outdoor cooking and frying, and extra mini freezer for game and fish. Fully furnished. Microwave, gas stove and fridge and basic cleaning supplies. Hi Def Smart TV and WiFi with Netflix, Hulu, YouTube, Amazon and other channels. Boat parking pad on premises, Windstorm tie downs on RV. Private location. Great place to relax on your deck, bird watch , kayak, or visit the aquarium and botanical gardens in Corpus Christi or the famous South Padre Island. Shop or get low cost drugs and dental care in Progreso, Mexico. Enter Progreso with only a driver's license and birth certificate for ID. Strict inventory of missing items and damages to property. No pets. No indoor smoking. The RV smells clean and non-mouldy like other coastal humid properties. I keep it climate controlled. Monthly rate is $850. Staying here is cheaper with a kitchen, freezer for fish, microwave and relaxing grilling on the shaded deck all afternoon. Local prepared food and basic toiletries are very expensive to buy here so I supply soap. shampoo, and cleaning supplies for the kitchen. Hair dryer provided. Rental property is a demand in this town and I can offer more than just a hotel room or an expensive waterfront residence with this cute all inclusive unit with boat parking. 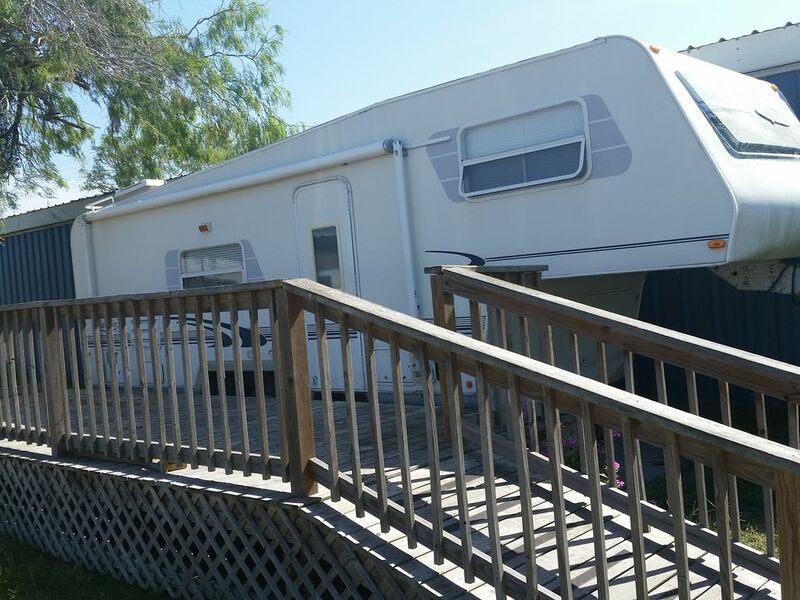 Remote private area of RV park with a deck and onsite boat parking. The USS LEXINGTON, CV-16, is a World War II-vintage Essex Class aircraft carrier. Commissioned in 1943, she served the United States longer and set more records than any other Essex Class carrier in the history of naval aviation. Most nicer restaurants, grocery stores and medical care is 24 -51 and 79 miles. This is a remote fishing community with 3 local restaurants and bars...Outlet shopping and restaurants are in surrounding cities. McAllen Texas Airport is usually cheaper than the closest airport which is Harlingen.